Black and white negative of a photograph of the Highway Cafe decorated to celebrate the 60th anniversary of Confederation. Draperies have been hung from the windows and there are some decorations in front of the restaurant. 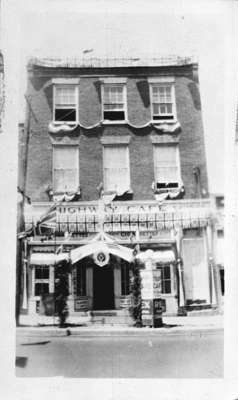 The Highway Cafe was a brick building located at 116 Dundas Street West on the north side between Byron and Brock Streets. It was operated by Arthur Stanlick who won second prize for store decorations at the Diamond Jubilee of Confederation.